In a soup pot, soften butter over high heat. Add all vegetables and herb. Cook till vegetables area unit tender, regarding ten minutes. Add flour and cook for an additional couple minutes, stirring to mix. Add tomatoes, oregano and broth; stir to combine; waken a boil. cut back heat and simmer for half-hour. Add fortified wine and cheese, stir and let cheese melt; cut back heat and simmer for an additional ten minutes. Remove herb. Puree with emulsion liquidizer. Return to stove; add in shrimp and scallops; still simmer for an additional couple minutes till food is grilled. Season to style with salt and pepper. Garnish with parsley, if desired. 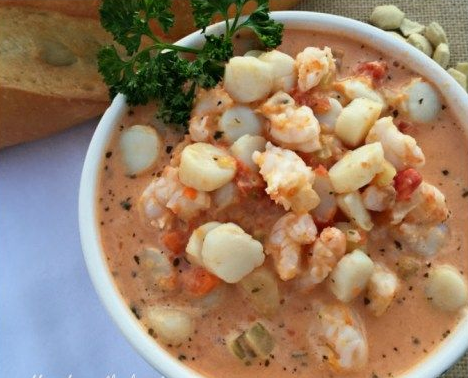 0 Response to "Creamy Tomato Seafood Bisque"